Among the myriad of roster moves that came at the backend of last week also came the news that veteran linebacker Sean Lee had restructured his contract with the Dallas Cowboys, assuring that the defensive leader will stay with the team for his ninth NFL season. The restructuring, which was first reported by NFL Insider Ian Rapoport, will see Lee make $3.5 million in 2019 as opposed to the $7 million he was set to make, but the new deal will give him an opportunity to earn back the remaining $3.5 million through a number of incentives. 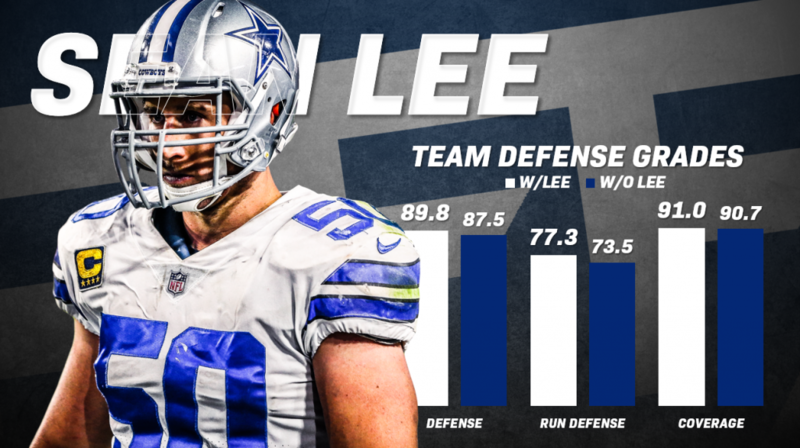 There is no doubt that Lee has been a star in the middle of the Dallas defense when he’s been on the field; the problem is that Lee hasn’t been on the field a whole lot. A number of serious injuries have limited him to just 1,729 of his team’s 2806 defensive snaps over the last three years, while as a whole, Lee has managed to play only 4435 of his team’s 8426 regular-season snaps (52.6%) since he was drafted back in 2010. Last season, thanks to a hamstring injury and the emergence of rookie sensation Leighton Vander Esch, Lee logged his lowest single-season snap count since his rookie year, playing just 247 snaps in just nine games. While Lee has had trouble staying on the field, that’s not to say he has not been excellent while he has been on the field. Since 2016, Lee has recorded an overall grade 81.5, a coverage grade of 79.6 and a run-defense grade of 85.2, which respectively rank ninth, eighth, and 13th among the 77 linebackers with at least 1000 defensive snaps in that three-year span. Displaying his dominance against the run, Lee has recorded 73 run stops over the last three NFL seasons, 23rd among off-ball linebackers in that time, but quite the feat when you consider that he ranks 52nd among players at the position in run-defense snaps played (616). His resulting run-stop percentage of 11.9% ranks first among all linebackers with at least 500 run-defense snaps since 2016, beating players like Luke Kuechly (11.2%), C.J. Mosley (9.5%) and Zach Brown (9.2%). He’s been no slouch in coverage either. Over the last three seasons, Lee has allowed 120 of his 144 targets in coverage to be caught, but he’s limited those catches to only 9.0 yards per reception, which ranks 10th among the 78 linebackers with at least 500 coverage snaps in that span. He’s allowed a passer rating of 99.7 on those throws, 34th among those players, while his average of 1.00 yards per coverage snap ties him for 28th. There is no doubt that the retention of Lee strengthens Dallas’ defense, but the combination of Lee, Vander Esch (85.7 overall grade in 2018) and Jaylon Smith (84.5) also gives them one of the strongest and deepest linebacking corps in the NFL. Coming off a defensively dominant season, the Cowboys have now taken a step towards securing the unit that performed so well a season ago.